Lilacs & Lace: The Dropped-Waist Dress: Très Chic or Terribly Unflattering? The Dropped-Waist Dress: Très Chic or Terribly Unflattering? 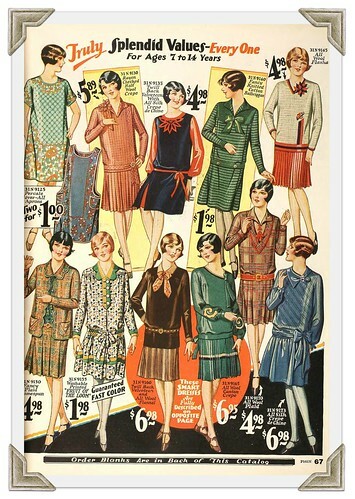 Today I thought I would continue with my 1920s fashion research. I know that there are quite a few people out there that avoid the dropped waist look because they believe it is rather unflattering. And to a certain extent, I agree. Seeing as I have a rather long torso, the silhouette actually makes me feel right at home – a design that accentuates what is already there! However, I have wide hips and a relatively small waist, and I like to accentuate the smallest part of my body. 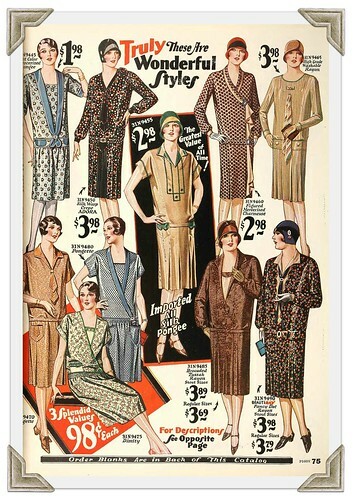 The flapper look does NOT accomplish this. But why should I let that stop me from enjoying a wonderful part of fashion history? Yes, it is arguably one of the least flattering looks for most female figures, but seeing these illustrations side by side makes me appreciate how amazing the fashions really were. It amazes me how many different looks can come from the same basic silhouette. The addition of a ruffle or some lace here and there, or a section of pleats and pintucks does wonders for the drop-waist look of the 1920s. Or how about a sash and a floppy bow? Buttons, buckles and brooches also add extra flash to the look. When I think about the amazing fabrics that they were made of, I wish I had an entire closet full! 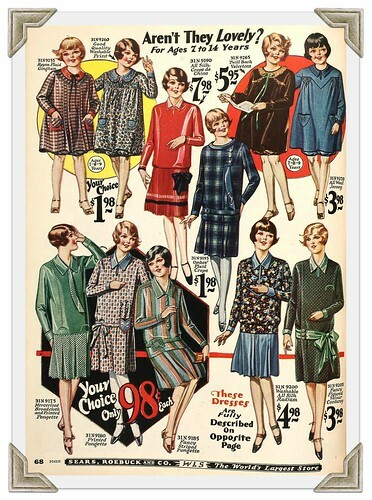 And these are just day dresses - the evening looks are spectacular. One day I will have to make a gown based on one of the amazing designs by Erté. 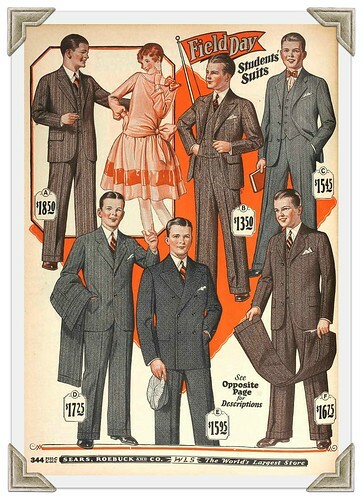 I think it is interesting to note that these fashions look the same on children, young adults, and adults alike. In fact, it is hard to tell which pages are catering to the young and the not so young unless you read the fine print. The Victorians were the first to create fashion specific to a younger generation that looked nothing like what adults of the time were wearing, only to have designers make an adult woman look just like a young girl with no curves a couple of decades later. 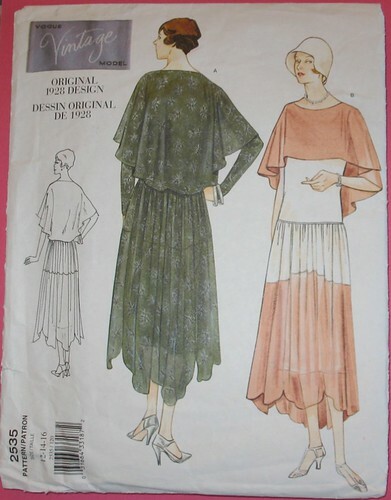 The pattern I have been working on is Vogue 2535. A bit shapeless, yes, but it is also unlike anything else I have, which is making for a fun project. 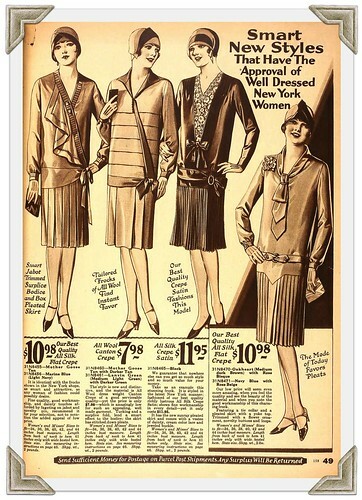 What I did not find were any scalloped hem dresses in the 1928 Sears Roebuck Catalog. 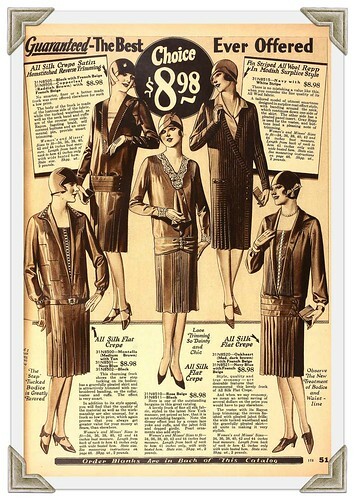 But perhaps Sears was not quite as up to date as Vogue? Makes sense to me! 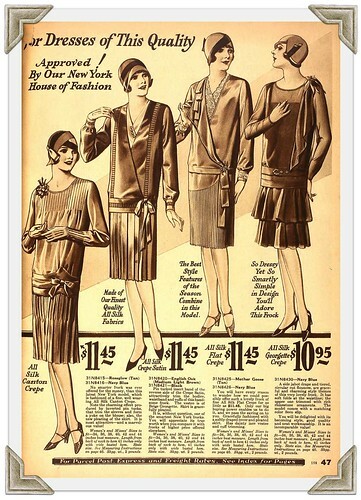 How the '20s styles look depends entirely on your body proportions. They really flatter short torsos and longer legs. I still remember a gorgeous pale pink chiffon dress my mom made me in 1967. While not quite the same proportions as the flapper dresses, it skimmed my skinny, rectangular figure and ended in a softly pleated short skirt a good four inches above my knees. I think it was the movie "Bonnie and Clyde" that brought the low waists into fashion that year. She completed the dress with a matching hand-rolled scarf and 60" of pearl beads. A pair of black patent French heels added the final touch. I got so many compliments on that dress, it was a joy to wear. Sure wish I had a photo! 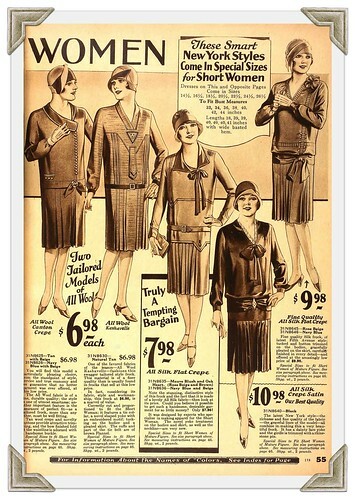 I find the 20s Flapper look is most flattering to the very thin woman who is also tall with long legs. And there is something youthful and fun about the look. But on me, it would look awful. I've always wanted to wear it, but it is not for the hippy- I look like Margaret Dumont in it! I can't wait to see what this dress looks like on you. Sometimes you don't know if something will work till you try it on! 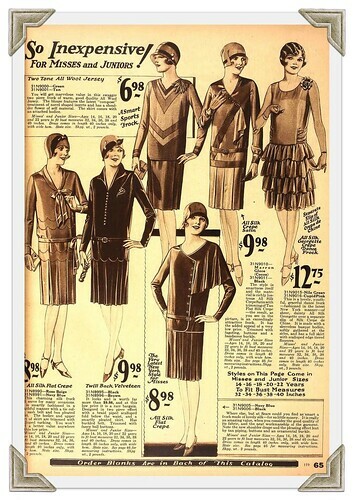 If you watch silent films, you can see that the dresses weren't as shapeless as the catalogs and pattern illustrations show. While the waist seam might be dropped, it looks like there is waist shaping at the natural waist. Maybe the actresses wanted to show off their figures more than everyday women and they wouldn't have been worn on the street that way, but it shows that 20s fashions can be made more flattering to a curvy figure. For one with a bust and hips, it would not be flattering. I have to question the scalloped hem. That doesn't seem to fit the usual trend of the period which emphasized sleek geometric lines and angles. I think it depends on body type. A rectangle or apple shape can probably wear them pretty easily, an hour glass or pear shape not so much. I think it is a seriously hard style to wear and probably best on young girls and women without figure flaws. However I was very surprised to see a drop waist on Project Runway this past week, so maybe there is a bit of a revival. But as Pam said, you always look fab and everything you sew looks amazing!